Memories of events that occur often are sensitive to interference from memories of similar events. Proactive interference plays an important and often unexamined role in memory testing for spatially and temporally unique events (“episodes”). Ketamine (NMDA receptor antagonist) treatment in humans and other mammals induces a constellation of cognitive deficits, including impairments in working and episodic memory. We examined the effects of the ketamine (2.5–100 mg/kg) on the acquisition, retrieval, and retention of memory in a delayed-match-to-place radial water maze task that can be used to assess proactive interference. Ketamine (2.5–25 mg/kg, i.p.) given 20 min before the sample trial, impaired encoding. The first errors made during the test trial were predominantly to arms located spatially adjacent to the goal arm, suggesting an established albeit weakened representation. Ketamine (25–100 mg/kg) given immediately after the sample trial had no effect on retention. Ketamine given before the test trial impaired retrieval. First errors under the influence of ketamine were predominantly to the goal location of the previous session. Thus, ketamine treatment promoted proactive interference. These memory deficits were not state dependent, because ketamine treatment at both encoding and retrieval only increased the number of errors during the test session. These data demonstrate the competing influence of distinct memory representations during the performance of a memory task in the rat. Furthermore, they demonstrate the subtle disruptive effects of the NMDA antagonist ketamine on both encoding and retrieval. Specifically, ketamine treatment disrupted retrieval by promoting proactive interference from previous episodic representations. Remembering events that occur frequently (where you parked your car or whether you turned off the oven) challenge the neural circuits engaged in memory. For those of us without a designated parking spot, we navigate to where we parked our car but not necessarily most recently. This is especially true if, on an unusual day, we move our car in the middle of the day and repark. Proactive interference plays an important and often unexamined role in memory testing for spatially and temporally unique events (“episodes”). The number of paradigms available to study this phenomenon in rodents is limited. Here we examine memory performance and proactive interference in a delayed-match-to place (DMP) radial water maze paradigm that combines elements of the Olton radial maze and the Morris water maze (Olton and Samuelson, 1979; Morris et al., 1982; Steele and Morris, 1999). Our version provides a single brief (∼4–10 s) experience (episode) in the form of a forced-choice swim (sample trial) to a submerged goal in one arm of an eight-arm radial water maze (see Fig. 1). The goal arm changes each session, and only one sample and one test trial (see Fig. 1) are provided per session. During the test trial, the most typical initial error is to an arm adjacent the goal. On rare occasions, the rat initially navigates to the goal of the previous session. Changes in the distribution of initial errors can be used to examine the source of memory deficits, including proactive interference from representations of the previous goal location. Glutamate receptors are important for cognition and the NMDA receptors (NMDARs) in particular play a profound role in cognition and synaptic plasticity (Morris et al., 1986; Bannerman et al., 2006; Robbins and Murphy, 2006). NMDARs are distributed broadly in the brain and densely within the hippocampus and neocortex (Sakurai et al., 1993; Monaghan et al., 1998). This distribution may underlie the preferential impairment of working and episodic memory after low to moderate doses of NMDAR antagonists. Studies in rodents and nonhuman primates demonstrate that NMDAR antagonists affect performance in tasks that engage frontal cortex and/or hippocampus. Although NMDAR antagonists typically disrupt encoding, the effect of NMDA treatment on retrieval and consolidation are more equivocal (for review, see Newcomer and Krystal, 2001; Morgan et al., 2004; Bannerman et al., 2006; Robbins and Murphy, 2006). In series studies, we examined (1) the influence of delay and intersession interval (ISI) on DMP performance, (2) the effects of ketamine (Ket) on encoding, retention, and retrieval and (3) state-dependent learning effects of ketamine. We demonstrate that memory performance in this task is sensitive to manipulations of delay and ISI. Furthermore, ketamine treatment disrupted both encoding and retrieval but had no effect on consolidation. Importantly, ketamine-induced retrieval deficits were related to an increase in proactive interference. The findings are discussed with respect to unique retrieval deficits observed under the influence of ketamine and the potential neurobiological substrates of NMDA antagonist-induced memory deficits. Three groups of male Sprague Dawley rats (Charles River Laboratories, Wilmington, MA) were used in these experiments. All rats were 3–15 months of age during training and testing and weighed 300–700 g (for ages during specific studies, see below, Experimental details). All rats were housed on a 12 h light/dark cycle, in individual Plexiglas pens in a temperature-controlled room. Water was available ad libitum. When the rats reached 450 g, their food intake was limited to ∼30 g/d. At the time of ketamine treatments, all rats weighed between 450 and 680 g. Ketamine hydrochloride (Ketaset, 100 mg/ml; Fort Dodge Laboratories, Fort Dodge, IA) was prepared in physiological saline (Sal) and administered intraperitoneally 20 min before behavioral testing in all studies. Except for the study examining state-dependent effects, all rats received no more than one ketamine treatment per week. All procedures were performed in accordance with the guidelines set forth by the Institutional Animal Care and Use Committee of University of Connecticut and National Institutes of Health. The water maze consisted of a black fiberglass pool (140 cm in diameter and 40 cm deep). The radial maze consisted of eight removable stainless steel corridors (painted flat black) that could be attached to a central octagonal hub. The central hub was 50 cm across with each corridor (14 cm wide) extending 36 cm to the far edge of the pool. The entire apparatus was filled with cool water (22 ± 2°C). The sides of the corridor extended 16 cm above the water level, sufficiently deep to prevent the rats from jumping to escape the apparatus. A removable platform constructed from black plastic (10 cm diameter) provided an escape platform that was submerged 6 cm beneath the surface of the water. The platform could be positioned at the end of any corridor providing an escape from the water. The entire apparatus was located in a large room with two empty walls, a long table, and the rat's cage rack forming the outer boundaries ∼1 m from the edge of each side of the pool. During testing, the room was darkened and a single floor lamp in the northeast corner of the room served as the only light source. Delayed-match-to-place radial water maze training and testing. Rats were handled for ∼5 min each day for the week before training. No special procedures were used to adapt the rats to either the water, swimming in the pool, or escaping via the platform. All rats were capable of navigating the corridors and using the escape platform on the initial training day. 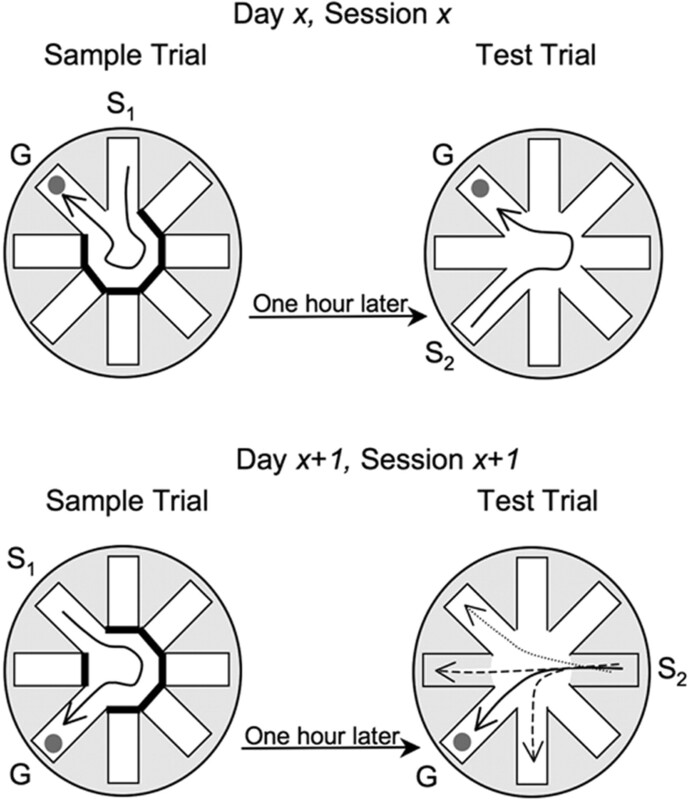 Training and testing of animals involved daily sessions (five sessions a week) composed of two trials: a forced-choice sample trial and a test trial (Fig. 1). During the sample trial, each rat was placed into the water at the end of the start arm. Except for the start and goal arm, all other arms were blocked. Each rat then swam out of the start corridor, navigated to the open goal corridor, and mounted the platform. Rats were removed immediately on mounting the platform, gently dried with a towel, and returned to their home cage on the adjacent cage rack until the test trial. Each rat took ∼4–20 s to complete the sample trial (Table 1). Delayed-match-to-sample radial water maze task. Each day (Day x, Session x) rats were given one forced-choice sample trial, with access to all but the start (S1) and goal (G) arm blocked. The goal arm contained a submerged platform. On the test trial (typically 1 h later), all arms were open and a different start (S2) arm was used to test memory for the spatial location of the current goal location. Typically only one sample and one test trial were given each day. Solid lines depict path to goal. The most common first errors are depicted in Test Trial on Day x + 1, Session x + 1. Once rats are well trained, the majority of first errors are to one of the arms on either side of the goal (adjacent; dashed line) or to the previous goal arm. During training, the retention interval was 1 h. For the test trial, rats were placed into a new start position, while the goal remained fixed between the sample and test trial. The same start position was never used for both the sample and test trial to ensure navigation based on memory of spatial position rather than memory of the turn angle. Each rat was tested each day of a 5 d workweek using a different start and goal arm each day. The start arm and goal locations were varied systematically in a fixed sequence of 48 patterns that regulated the sequence of start and goal arms and the relationship between the start and goal arms across trials. All arms served as start and goal arms approximately equally across each 24 d of testing. The goal location was restricted to arms 90° (two arms) or more away from the “previous” goal location to prevent overlap of previous and “adjacent” errors. On all ketamine or saline treatment trials, this was extended to three arms away from the previous goal location (supplemental Fig. S3, available at www.jneurosci.org as supplemental material). To determine whether the rats could use, or learn to use, intramaze cues (visual, olfactory, or somatosensory) to navigate to the goal location, we examined performance during control trials. During these control trials, no forced-choice sample trial was given and rats had to seek and find the goal platform, which was moved to a random new location. These trials provided an index of random performance (see Fig. 2A). We also assessed performance immediately after the control trial by giving the rats a second trial (within 2 min) to examine performance: (1) at a “short” delay and (2) under the condition where they located the goal using a free-choice sample trial compared with the forced-sample trial (see Fig. 2A, 2-MIN). Dependent measures were the number of incorrect arm entries during the test trial, latency/choice for the sample and test trials, and the position of the first error during the test trial. First errors were classified into either (1) the “previous goal” (rats were given only one sample and one test trial each day, and, unless noted otherwise, the previous goal was the goal used 24 h earlier), (2) “adjacent arm” (either arm adjacent to the goal location), or (3) “other choice” (any arm entry other than the “correct goal” arm, the previous goal, or an adjacent arm) (Fig. 1). Studies were conducted on three separate groups of rats (experimental studies 1, 2, and 3). Acquisition data for all three groups are presented in supplemental data (supplemental Fig. S1, available at www.jneurosci.org as supplemental material). The first set of studies (experimental studies 1: delay-dependent memory performance; n = 22) examined the effects of parametric manipulations of delay length and ISI on radial water maze performance. In experiment 1A, we examined performance at various delay intervals at 6 months (340–480 g) and again at 12 months (440–610 g) of age. These rats were also used for pilot ketamine experiments in the months between the 6- and 12-month-long delay testing. In the pilot ketamine experiments, each rat received four doses of 25 mg/kg (one dose per week) during the delay interval of the DMP task. Acute effects of ketamine on memory performance and sensorimotor function were observed without any influence on performance on subsequent days of testing. After the completion of the second bout of long-delay testing, these rats were used in experiment 1B that examined performance in which the intersession interval (typically 24 h) was manipulated to examine proactive interference between testing sessions (experiment 1B). A second set of studies (experiment studies 2: ketamine effects on memory performance; n = 24) using separate rats examined the effects of ketamine at different doses and time points [before sample (encoding); after the sample (retention) and before testing (retrieval) with respect to radial water maze performance). A third study (experiment 3: state-dependent learning effects; n = 24) was used to examine any state-dependent effects of ketamine. Experimental studies 1: delay-dependent memory performance. Experimental studies 1 included two studies to examine performance at varying delay intervals at 6 and 12 months of age (experiment 1A) and performance in which the intersession interval (typically 24 h) was systematically manipulated (experiment 1B). This group of rats were initially trained in the DMP radial water maze task for 12 weeks with a 1 h retention interval. We then examined performance on a series of long delays (4–48 h) with each delay tested five times over the course of several weeks. At this point, the rats were 6–8 months of age. After the long-delay testing, these rats were used for pilot ketamine studies to assess the effects of 25 mg/kg administered at different time points (data not shown). To determine whether the extensive training or repeated ketamine treatments had any chronic influence on performance, we retested these rats over the same course of long delays (4–48 h). Finally, these same rats were used to examine the effects of manipulating the intersession interval (experiment 1B). The ISI refers to the amount of time between the end of one sample-test session and the beginning of the next sample-test session. Rats were trained/tested once daily, so the ISI is typically 24 h (Fig. 1). In this experiment, the ISI varied by 72, 24, or 2 h. The latter involves testing the rats twice a day with different goal locations in each session. This is analogous to moving one's car to a different parking spot every 3 d, once a day, or twice a day. For these sessions, the delay interval between sample and test trial was always 1 h.
Experimental studies 2: ketamine effects on memory performance. Experimental studies 2 examine the dose effects of ketamine on encoding, retention, and retrieval. A separate group of adult (n = 24) rats were trained to perform this task. All rats tested were extensively trained with a 1 h retention interval and had minimally 16 weeks of training before any ketamine treatments. Each rat received only one intraperitoneal treatment per week (ketamine or saline), while being tested 5 d/week. Three within-subject experiments [experiments 2A (encoding), 2B (retention), and 2C (retrieval) were conducted that examined the effects of ketamine (0, 2.5, 12.5, and 25 mg/kg)]. Half of the rats (n = 12) participated in the presample (experiment 2A; encoding) dose–response testing, and half (n = 12) participated in the pretest (experiment 2C; retrieval) dose–response testing. The order of all treatments was counterbalanced, and half of each group received doses in ascending or descending order. To examine retention, all rats (experiment 2B; n = 24) received one dose of saline or 50 or 100 mg/kg ketamine the week before or the week after participating in the dose–response testing on encoding or retrieval. The order of treatments was counterbalanced so that half receiving 50 or 100 mg/kg were either in the encoding or retrieval subset. Thus, the effects on acquisition (experiment 2A; n = 12) and retrieval (experiment 2C; n = 12) involved a complete within-subjects design with ascending and descending dose treatments. The effect on retention (experiment 2C; n = 24) was examined with half the rats receiving 50 mg/kg ketamine and saline and the other half 100 mg/kg ketamine and saline in counterbalanced order. These studies were designed to detect treatment (dose) order effects as well as any habituation to the effects of ketamine. Despite our best efforts to identify any chronic or subchronic effects of ketamine, no residual effects were observed on the day after treatment (see Figs. 3, 4). Even the 100 mg/kg dose did not alter performance on the day of treatment or the day after treatment, as assessed in our standard 1 h testing protocol. Experimental study 3: state-dependent learning effects. Experimental study 3 examined whether the effects of ketamine on retrieval were related to state-dependent effects. A separate third group of rats (n = 24) were trained with a 1 h retention interval and had minimally 16 weeks of initial training before ketamine treatments. This group was used to examine the effect of ketamine or saline treatment when administered before both the sample and test trial within the same session (state-dependent learning effect). Each rat received two injections each Tuesday (while being tested each day of the 5 d workweek) for 7 weeks. Saline or ketamine (6.25 and 12.5 mg/kg) was administered intraperitoneally 20 min before each sample session as well as 20 min before each test session, with the order of treatments [Sal–Sal, Ket(6.25)–Sal, Ket(12.5)–Sal, Sal–Ket(6.25), Sal–Ket(12.5), Ket(6.25)–Ket(6.25), and Ket(12.5)–Ket(12.5)] counterbalanced across weeks. Error and latency data were analyzed using repeated-measures (RM) ANOVA testing for both drug order (ascending vs descending dose) and trend analyses. Dunnett's tests were performed to assess specific control–ketamine treatment comparisons, and paired t tests were used for all other comparisons. The pattern of errors was assessed using a χ2 analysis (Preacher, 2001). For ease of data presentation, the first error frequency distribution has been converted to percentages. Analyses were conducted using SPSSX (SPSS, Chicago, IL) or Microsoft (Seattle, WA) Excel on a Windows-compatible computer. First, we describe the performance of a group of rats (n = 22) initially trained in the DMP radial water maze task for 12 weeks with a 1 h retention interval. After 12 weeks of training, mean performance was approximately one error per day, with approximately half the rats making no errors on any given day. At this point, we examined rats' performance on a series of long delays (4–48 h, with each delay tested five times over the course of several weeks): once when the rats were 6–8 months of age and again at 12–14 months of age. Errors increased as a function of delay length but not age (Fig. 2A). RM-ANOVAs on the number of errors as a function of delay (1, 4, 24, and 48 h) at both age time points were significant (F(3,63) > 26.9; p values < 0.001). There was no difference between performance at 6 and 12 months of age (Fig. 2A). Latency measures (latency per choice for sample trial and test trial) did not vary as a function of delay (Table 1). Delay-dependent memory performance in a DMP radial water maze task. A, Effect of varying the retention interval (delay between sample and test trials). Means ± SEM represent five trial blocks at each delay. Control trials (CON) involved no sample trial with the goal moved to a new location (find the platform yourself). Horizontal gray band indicates range of 10 control trials. After a control trial, rats were returned to the maze within 2 min for a short-delay trial (2-MIN). Rats were tested on a series of long delays (4–48 h) at both 6 and 12 months of age. B, Effect of varying the intersession interval on mean ± SEM errors. Errors doubled when rats were tested on two sample-test sessions with different goal arms in the same day. Each ISI was tested four times. C, The distribution of first error by type for all long-delay trials is shown for each delay. The percentage of rats making no errors (first choice was correct goal) is presented at no error (dark gray). Note that, with increasing delays, more rats made an initial error and that the majority of first errors are to the arms adjacent to the goal (white). Thus, at 1 h delay ∼50% of rats made at least one error, with the majority being to the adjacent arm and a smaller percentage to the goal of the previous day or one of the three other arms. This distribution did not vary as a function of delay (compare 1HR–48HR and MIN-2). During control trials, the majority of errors are, as might be expected, to the previous goal arm (black). The distribution of previous, adjacent, and other errors during control trials was significantly different from all other distributions (*p < 0.001, χ2 test). All of the other distributions (1HR–48HR and 2-MIN) were not different from each other. D, The distribution of first error by type for all ISI trials. The distribution of previous, adjacent, and other errors during 2 h ISI trials was significantly different from distribution during 24 and 72 h ISI trials (*p < 0.001, χ2 test). Notably, the distribution of error types during 2 h ISI trials was similar to the distribution during control trials, with the majority of rats initially choosing the previous goal arm. We ran five control trials (Fig. 2A, CON) at the 6 and 12 month time points. During these control trials, no forced-choice sample trial was given and rats had to seek and find the goal platform. These trials provided an index of random performance and assessed the rat's potential to navigate to the goal platform using nonmemory cues (visual, olfactory, and somatosensory). Errors on these trials averaged 4.3 ± 0.4 and 4.5 ± 0.3 at 6 and 12 months, respectively. We then gave rats a second trial (within 2 min) to assess performance at a short delay and under a free-choice sample trial compared with a forced-sample trial (Fig. 2A, 2-MIN). Errors on these short-delay trials averaged 1.0 ± 0.1 and were not significantly different from performance at 1 or 4 h delay intervals (paired t tests, p > 0.20). After either a 2 min or 1 h delay, ∼50% of rats make no errors on any test trial (Fig. 2C). Perhaps the most important aspect of this task is the ability to examine explicit sources of errors. For all trials, we characterized the first choice as (1) no error, (2) the goal arm of the previous session, (3) one of the two adjacent arms, or (4) any other arm (Fig. 1). In this regard, an initial error to one of the two adjacent arms may be considered a navigation error attributable to weak representation of the goal. In contrast, an initial error to the previous goal arm indicates proactive interference and suggests that the rats are accessing the previously formed representation of the goal and not the newly formed representation. For the 1 h delay sessions, the mean percentage of trials with no errors was 52%, whereas the mean percentage of trials with one or more errors was 48% (Fig. 2C). In 27% of the trials with an error, the first error was to one of the two adjacent arms, whereas in 11% of the trials rats chose the previous arm, and 10% of the rats chose one of the three other arms. This distribution was consistent over each delay interval including the short 2 min (Fig. 2C, 2-MIN) delay sessions. This distribution of error data were similar at both 6 and 12 months of age. Below we discuss the data as a percentage of rats making a first error and the distribution of error type as a function of “chance.” On any testing day, 50–100% of rats make one or more errors. Excluding the correct goal and the chance that the rat exits and reenters the start arm, there are six available arms. Two of the six are adjacent to the goal (2 of 6 = 33%), one is the previous goal arm (1 of 6 = 17%), and three are other arms (3 of 6 = 50%). Thus, by chance, the distribution of first errors should approach 33% adjacent, 17% previous, and 50% other. First errors to the previous and adjacent arms should account for 50% (33 + 17%) of all first errors, and the other category should account for 50%. Examining the 1 h delay session data (Fig. 2C) as a percentage of rats making an error, 56% of all first errors were to one of the two adjacent arms, 23% were to the previous goal arm, and 21% were to one of the three other arms. In almost all sessions in which a large number of rats make an error, the previous and adjacent arms typically account for ∼70–100% of first errors, whereas errors to the other arms typically accounts for <30% of the first errors (Fig. 2C,D) (supplemental Figs. S2, S3, available at www.jneurosci.org as supplemental material). Compared with the delay trials, the distribution of errors changed on the control trials, when the rats were not given a sample trial. Over the five control sessions rats, made one or more errors on 94% of these trials (Fig. 2C). By chance, some rats should pick the correct goal arm first. We observed this on 6% of the trials with a mean of 1.2 ± 0.2 rats making no errors on any given control trial. No rat did this more than once over each of the five control trials. During control trials, first errors were predominately to the previous goal arm. Rats chose the previous goal arm first on 47% of the trials, the adjacent arm on 15%, and all other arms on 32%. This distribution was significantly different from what would be expected by chance (χ2 = 73.1; df = 2; p < 0.0001) and was significantly different from all other first error distributions at each delay interval. If we accept that rats maintain representations of the goal location to perform accurately at 24 and 48 h delays, it is not surprising that they maintain this representation for use during the control trials when they have no other knowledge about the goal. The control trial is not a perfect index for determining how many arms are needed to find the goal by “chance” because half the rats use their first choice on the previous goal arm. However, this control trial is an important demonstration that rats do not use visual, olfactory, or somatosensory cues to locate the goal during the test trial. Performance in this DMP radial water maze task is sensitive to interference, with memories of the goal position of the previous day interfering with the rat's performance on any given day. After the completion of all long-delay testing, we examined the effects of manipulating the ISI. The ISI refers to the amount of time between the end of one sample-test session and the beginning of the next sample-test session. Rats are trained/tested once daily, so the ISI is typically 24 h (Fig. 1). In this experiment, the ISI varied between 72, 24, or 2 h. The latter involves testing the rats twice a day with different goal locations on each session. This is analogous to moving one's car to a different parking spot twice a day, once a day, or once every 3 d. The delay interval between sample and test was always 1 h. An RM-ANOVA on the number of errors as a function of ISI (2, 24, and 72 h) was significant (F(2,42) = 29.4; p < 0.001) The mean number of errors more than doubled for the 2 h ISI and was significantly greater for the 2 h ISI than either of the longer (24 and 72 h) ISI intervals (Fig. 2B) (paired t tests, p < 0.001). Examining the distribution of first error type when rats were tested twice in the same day provided an explicit view into the role of interference across sessions (Fig. 2D). Rats were tested at each ISI four times. When tested twice in a day (2 h ISI), rats made errors on 75% of all test trials. They made their first error to the previous arm on 50% of trials, the adjacent arm was chosen on only 9%, and all other arms on 16%. This distribution was significantly different from the distribution of errors at the 24 and 72 h ISIs (χ2 values = 36.6; p values < 0.001). This demonstrates that memory for the goal arm of the previous session does interfere with memory of the sample trial goal on the second sample-test session of the day. Ketamine administered 20 min before the sample disrupted memory performance when rats were tested 4 h, 20 min after drug treatment (Fig. 3B, left). Ketamine treatment produced a linear increase in errors. An RM-ANOVA on the number of errors indicated a significant (F(3,33) = 8.73; p < 0.01) treatment effect as a function of dose (0, 2.5, 12.5, and 25 mg/kg), with all doses significantly increasing the number of errors compared with saline treatment (Dunnett's t tests, p values < 0.05). Rats receiving the 25 mg/kg treatment performed near chance levels. No differences in latency/choice were observed either in the sample trial latencies (when drug was “onboard”) or hours later on the test trial (Table 2). It should be noted that many rats are hyperactive (Imre et al., 2006) and exhibit motor ataxia after 25 mg/kg ketamine. Even after 20 min, some rats are slightly ataxic. Nonetheless, once placed in the water, the rat's swimming is not impaired and their latency to find the platform is not altered. Dose effects of ketamine (2.5–100 mg/kg) on encoding, retention, and retrieval. Top schematic (A) illustrates sequence of sample and test trials and the administration of ketamine on encoding (presample dose), retention (after-sample dose), and retrieval (pretest dose) using a 4 h retention interval. Mean errors (B) illustrate the dose-related effect of ketamine on encoding (left), retrieval (right), but not retention (center). Gray band illustrates the range of mean errors per day for all 1 h delay trials on the days after ketamine or saline treatments. *p < 0.05 compared with either presample or pretest saline (0) treatment. C, Effects of collapsed dose treatments on the distribution of first error by type. There were no differences in the distribution of first errors between saline, presample, or after-sample ketamine (p values > 0.2, χ2 test). However, ketamine administered before the test session altered the distribution of first errors by reducing the number of errors to the adjacent arms and increasing the number of first errors to the previous goal position. The distribution of previous, adjacent, and other errors during pretest ketamine trials was significantly different from all other distributions (*p < 0.001, χ2 test). 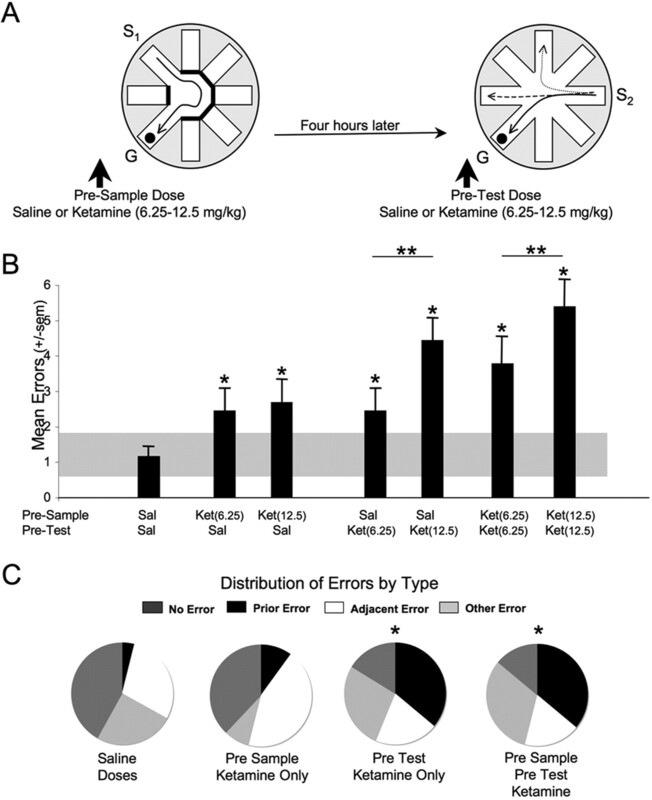 Note that both presample ketamine and pretest ketamine increased the mean number of errors (B) and the number of rats making at least one error (C). However, presample ketamine resulted in more initial errors to the adjacent arm, whereas pretest ketamine resulted in more initial errors to the previous arm. The distribution of errors after pretest ketamine is analogous to that observed on control trials when rats have no knowledge of the new goal and navigate to the previous goal location (see Fig. 2C) or the condition of two sample-test trials in the same day evidencing proactive interference (see Fig. 2D). S1, S2, Start arms; G, goal arm. The distribution of first errors for all presample ketamine treatments (2.5, 12.5, and 25 mg/kg) was consistent with the prototypical pattern observed across all delay intervals. Figure 3C shows this distribution for all saline treatments collapsed across presample, after-sample, and pretest conditions and ketamine doses. Again, the majority of first errors were to one of the adjacent arms. Thus, the deficit observed when ketamine is administered before the sample suggests a weakened representation of the goal location. This pattern was still apparent even at the highest (25 mg/kg) dose. The small sample size used and the limited number of rats making errors at each dose did not allow us to make a statistical test on data from each specific dose, thus data were pooled across doses. Ketamine administered immediately after the sample (within 1 min) had no effect on memory performance when rats were tested 4 h later (Fig. 3B, center). No difference in latency/choice was observed (Table 2) during the test session 4 h after treatment. The distribution of first errors for both after-sample ketamine treatments (50 and 100 mg/kg) was consistent with the prototypical pattern observed across all delay intervals (Fig. 3C). These findings replicated pilot observations that no retention deficit is observed when ketamine (25 mg/kg) was administered after the sample trial, and rats were tested 24 h later. We found no retention deficit when ketamine is administered after the sample, and testing occurs with sufficient time after treatment to avoid the influence of ketamine on retrieval. Ketamine administered 20 min before the test trial impaired memory performance (Fig. 3B, right). Ketamine treatment (0, 2.5, 12.5, and 25 mg/kg) produced a linear increase in errors (F(3,33) = 6.13; p < 0.01), with both the 12.5 and 25 mg/kg doses significantly increasing the number of errors compared with saline treatment (Dunnett's t tests, p values < 0.05). No difference in latency/choice was observed during the test session, which occurred 20 min after the ketamine treatment (Table 2). The distribution of first errors for pretest ketamine treatments evidenced a significantly different distribution compared with saline treatments (χ2 = 14.2; df = 2; p < 0.001) and presample ketamine (χ2 = 17.2; df = 2; p < 0.001) (Fig. 3C). We note that a large number of rats chose the previous arm with increasing ketamine dose (1, 3, 6, and 7 rats of 12 choosing the previous arm after saline and 2.5, 12.5, and 25 mg/kg ketamine, respectively). The small sample size used and the limited number of rats making errors at each dose did not allow us to make a statistical test on data from each specific dose, thus data were pooled across doses. To examine any state-dependent effects of ketamine, we examined the effects of two ketamine doses (6.25 and 12.5) administered twice in one session (Fig. 4A). Ketamine (or saline) was administered once before the sample trial and once before the test trial in seven different treatment combinations [Sal–Sal, Sal–Ket(6.25 mg/kg), Sal–Ket(12.5 mg/kg), Ket(6.25)–Sal, Ket(12.5)–Sal, Ket(6.25)–Ket(6.25), and Ket(12.5)–Ket(12.5)]. An RM-ANOVA on the number of errors as a function of all seven treatment combinations revealed a significant effect of treatment (F(6,138) = 6.6; p < 0.001) (Fig. 4B). An RM-ANOVA for presample ketamine treatments [Sal–Sal, Ket(6.25)–Sal, and Ket(12.5)–Sal] was significant (F(2,46) = 3.48; p = 0.039), with both ketamine presample treatments significantly increasing the number of errors compared with the Sal–Sal control treatment (Dunnett's t tests, p values < 0.05). An RM-ANOVA for pretest ketamine treatments [Sal–Sal, Sal–Ket(6.25), and Sal–Ket(12.5)] was significant (F(2,46) = 12.03; p < 0.001), with both ketamine pretest treatments significantly increasing the number of errors compared with the Sal–Sal control treatment (Dunnett's t tests, p values < 0.01). An RM-ANOVA on state-dependent treatments [Sal–Sal, Ket(6.25)–Ket(6.25), and Ket(12.5)–Ket(12.5)] was also significant (F(2,46) = 13.71; p < 0.001), with the dual ketamine treatments significantly different from the Sal–Sal control treatment (Dunnett's t tests, p values < 0.01). Lack of state-dependent effects of ketamine (6.25 or 12.5 mg/kg) on encoding and retention. A, Schematic illustrates presample dosing of saline or ketamine, followed by a pretest dosing of saline or ketamine. Each rat (n = 24) received each of seven treatment combinations [Sal–Sal, Ket(6.25)–Sal, Ket(12.5)–Sal, Sal–Ket(6.25), Sal–Ket(12.5), Ket(6.25)–Ket(6.25), and Ket(12.5)–Ket(12.5)] over the course of 7 weeks of testing (1 treatment per week). B, Effects of ketamine on encoding and retrieval, as well as the greater impairment when both the sample and test trials were run under the influence of ketamine. Gray band illustrates the range of mean errors per day for all 1 h delay trials the day after ketamine or saline treatments. *p < 0.05 compared with Sal–Sal treatment mean (Dunnett's t tests); **p < 0.05 compared with indicated ketamine dose (paired t test). C, Effects of collapsed dose treatments on first error by type. Note that ketamine administered before the test session or before both the sample and test session altered the distribution of first errors by reducing the number of errors to the adjacent arms and increasing the number of first errors to both the previous goal position and other arms. The distribution of previous, adjacent, and other errors during both pretest and presample/pretest ketamine trials was significantly different from all other distributions (*p < 0.001, χ2 test). This distribution of errors is similar to that observed in Figure 3C (pretest ketamine doses) and further suggests that, under the influence of ketamine, rats are accessing the previously formed representation of the goal and not the newly formed representation. S1, S2, Start arms; G, goal arm. No difference was observed between the doses of ketamine (6.25 vs 12.5 mg/kg) administered only before the sample trial (Fig. 4B), whereas a dose-dependent difference was observed when ketamine was administered only before the test or before both the sample and test. No differences in latency per choice were observed during either the sample trial (20 min after treatment) or during the test trial for any treatment combination (data not shown). The distribution of first errors for pretest-only ketamine treatments [both Sal–Ket(6.25) and Sal–Ket(12.5)] and presample, pretest ketamine treatments [Ket(6.25)–Ket(6.25) and Ket(12.5)–Ket(12.5)] was significantly different compared with saline or presample ketamine treatments (Fig. 4C) (χ2 values = 9.6 and 12.9; df = 2; p < 0.001). There was no difference in the distribution of errors comparing pretest only ketamine with presample, pretest ketamine. These findings are thus consistent with results presented in Figure 3C. The small sample size used and the limited number of rats making errors at each dose did not allow us to perform a statistical test on data from each specific dose, thus data were pooled across doses. 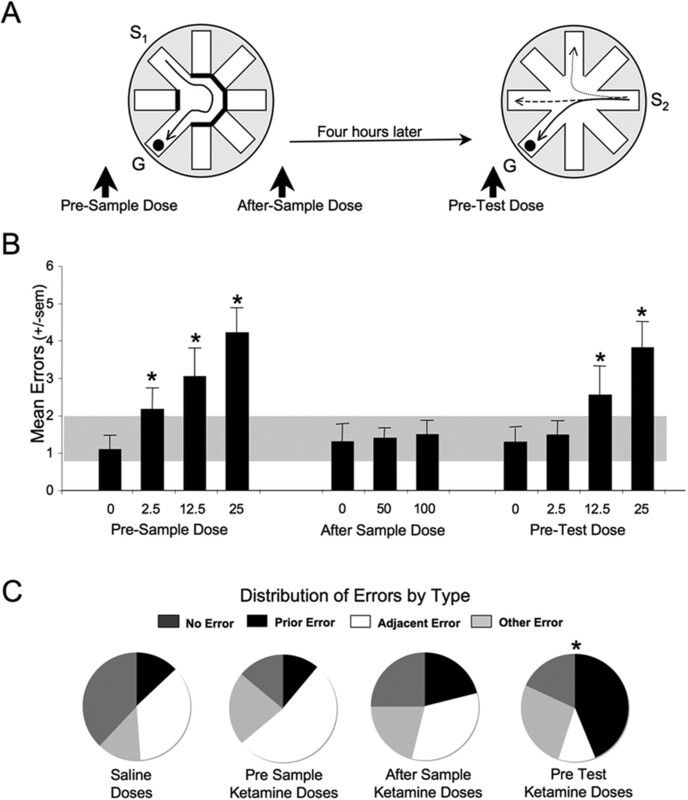 Supplemental Figure S3 (available at www.jneurosci.org as supplemental material) illustrates the distribution of errors with respect to the current and previous goal for all dose combinations. In the present study, we used a novel DMP radial water maze task to examine memory for spatiotemporal unique episodes and the competing influence of distinct memory representations (proactive interference) each day. We demonstrate that memory of the goal location, acquired in a single brief (∼4–10 s) experience, can guide performance for minimally 2 d. In each daily session, the rat acquires a new memory and can be tested every day for many months, if not their entire lifespan. The task provides a vehicle for exploring the strength of, and competition between, distinct representations of episodes in the rat and their underlying neural substrate. Furthermore, we demonstrate that the NMDA antagonist ketamine disrupts both encoding and retrieval but not consolidation in this task and that ketamine treatment disrupts retrieval by promoting proactive interference from previous episodic representations. The lowest dose of ketamine (2.5 mg/kg) impaired the encoding of “new” information about the location of the goal. The majority of first errors were systematically biased to one of the arms adjacent the goal. Thus, performance 4 h after ketamine was similar to performance without ketamine but with a longer retention interval (compare Figs. 2, 3). This suggests that the “strength” of the encoded representation is weakened under the influence of ketamine (Kentros et al., 1998). Studies have shown that posttraining administration of NMDA antagonists can disrupt retention or consolidation when administered after the acquisition of information (Packard and Teather, 1997; Santini et al., 2001; McDonald et al., 2005) (but see Day and Langston, 2006). We found no evidence that ketamine (50–100 mg/kg) affected retention when the drug was administered after the sample. After a 100 mg/kg dose of ketamine, rats become immobile and lose their righting reflex within ∼5 min. Many still respond reflexively to a paw pinch but do not regain righting and mobility for ∼1 h. These doses likely alter a number of physiological events for hours that have no influence on retention. It is important to note that it takes minutes for peripherally administered ketamine to be distributed in the brain, and thus posttraining intracranial infusions of NMDA antagonists may influence consolidation. Perhaps the most surprising result demonstrated that administration of ketamine before the test trial produced an increase in proactive interference with an increased preference for the previous goal arm. An initial error to the previous goal arm suggests that the rats are accessing the previously formed (24 h old) representation of the goal and not the newly formed (4 h old) representation. Testing in this condition was in the presence of ketamine, and thus some concern for influences on sensorimotor function are important. However, at the doses and time points we tested, ketamine treatment had no obvious effect on sensorimotor function: the animals swam and navigated to the goal without any changes in latency. Importantly, under the influence of ketamine, rats did not make nonspecific errors but often navigated directly to the previous goal. The fact that ketamine-treated rats showed a preference for the previous arm suggests that the increase in errors is not directly attributable to an impairment in sensorimotor function. Despite the lack of obvious changes in sensorimotor function and the initial navigation to the previous goal, the possibility remains that the rat is mildly intoxicated and that an altered sensory experience contributes to the retrieval deficit. One might ask whether the increase in proactive interference would occur with other conscious state-altering drugs such as alcohol or hallucinogens. Human studies do not suggest a specific increase in proactive interference after ethanol treatment (Lombardi et al., 1997), although how the observed proactive interference effect might vary with different state-altering drugs is an open question. The effects of a global NMDAR blockade on encoding, retention, and retrieval have been equivocal, and results often vary as a function of task. Studies typically have examined NMDAR blockade with ketamine, phencyclidine, D(−)-3-(2-carboxypiperazine-4-yl)-propyl-1-phosphonic acid (CPP), or dizocilpine (MK-801). Each of these drugs has a unique pharmacologic profile, but each is an open channel blocker of the NMDA channel (Dingledine et al., 1999; Millan, 2005). The effects on cognitive performance are as consistent across drug types as across task conditions. There are several comprehensive reviews (Newcomer and Krystal, 2001; Krystal et al., 2002; Bannerman et al., 2006; Robbins and Murphy, 2006). The majority of studies have demonstrated an encoding deficit and/or an impairment in the rate of acquisition/performance of a learned task. A distinction should be made between the acquisition of learned tasks with both procedural and declarative components concurrently acquired and performance in tasks in which the procedural aspect is well trained, and the declarative or episodic component is acquired in a single, often brief, experience (e.g., the DMP water maze). Human memory tasks often rely on well learned or familiar paradigms in which the procedural aspects of tasks are consistent with an individual's lifetime experience and are typically conveyed by verbal information (Honey et al., 2005). This contrasts with much of the animal literature, in which rats are trained in tasks acquired in 1 to several days before treatment. Given the widespread distribution of NMDAR in cortical areas, it is likely that both procedural and “declarative” aspects of many tasks are altered by NMDAR blockade. The information processing functions of the hippocampus and prefrontal cortex, as well as many areas of limbic cortex, are adapted to provide flexibility in acquiring both procedural and declarative tasks. Such flexibility may be most sensitive to pharmacologic and neurologic insult. In this regard, would rats trained for 8 weeks, 8 months, or 16 months on the present DMP task be more or less sensitive to proactive interference or ketamine treatment? We suggest that the degree of training in the procedural components of the task and the familiarity of the stimulus material would make a difference. As noted previously, the effect of NMDA antagonists likely depends “upon environmental familiarity, dose and the training duration” (Caramanos and Shapiro, 1994). How well learned is the procedural “program” of the task in which the specific event to be remembered is embedded? The latter may be an important source of the variability observed after pharmacologic or neurologic insult to frontal, hippocampal, and medial temporal lobe structures in animals performing memory tasks (for discussion, see Lee and Kesner, 2003; Eichenbaum, 2004; Nemanic et al., 2004). Ketamine induces a range of physiological effects consistent with the wide distribution of NMDAR in the brain. The present data make no statement about the underlying mechanisms, although we suggest the alterations of memory may depend on physiological changes subsequent to NMDAR blockade in hippocampal and/or prefrontal cortical function. A number of studies by Moghaddam and colleagues (Verma and Moghaddam, 1996; Adams and Moghaddam, 1998; Moghaddam, 2004) demonstrate that ketamine (10–30 mg/kg) and other NMDAR antagonists (e.g., CPP) produce deficits in working memory concurrent with increases in glutamate and dopamine release in the prefrontal cortex and nucleus accumbens. Furthermore, the disruptive effects of NMDAR antagonists can be reversed by either dopamine or glutamate antagonists (Verma and Moghaddam, 1996; Moghaddam et al., 1997). Our preliminary evidence indicates that doses between 2.5 and 25 mg/kg ketamine also produce dose-related changes in the amplitude and coherence of hippocampal theta and gamma waves and decouples gamma from its normal modulation by theta (Bragin et al., 1995; Canolty et al., 2006). In this regard, dysregulation of hippocampal and neocortical networks by ketamine may profoundly alter mesocorticolimbic glutamate and dopamine systems and their dynamic interplay (Verma and Moghaddam, 1996; Moghaddam et al., 1997; Svensson, 2000; Moghaddam, 2004). Frontal cortical networks important for mediating discrete-trial memory for use within seconds (working memory) can be expected to interact with hippocampal networks critical to maintaining representations over extended delays (Lee and Kesner, 2003). Both structures likely play a role in episodic memory formation and the discrimination of temporal context. The DMP radial water maze paradigm allows for an examination of proactive interference and allows for an assessment of how treatments may differentially affect memory across different retention intervals. This may provide insight into interactions between prefrontal and hippocampal substrates of episodic memory. Each day we perform a multiplicity of tasks that depend on accurate retrieval of “episodic” information (items/events that occur in a unique spatiotemporal context). Often there is tremendous overlap in the cues needed to retrieve the appropriate representation, and we sometimes retrieve a related albeit incorrect memory. Notably, we navigate to where we parked our car yesterday; we recall that we told someone something, when we actually told someone else, etc. Rodents are particularly adept at remembering “places” (the location of hidden platforms or food stores in a maze) and rapidly changing contingencies associated with places. Thus, they exhibit episodic-like memory for information acquired in specific spatial and temporal contexts. The presented studies provide a paradigm for examining interference across discrete trials in rodents and highlight the unique constellation of cognitive deficits associated with NMDAR blockade. This work was supported by the University of Connecticut Research Foundation. (1998) Corticolimbic dopamine neurotransmission is temporally dissociated from the cognitive and locomotor effects of phencyclidine. J Neurosci 15:5545–5554. (2006) The drugs don't work—or do they? Pharmacological and transgenic studies of the contribution of NMDA and GluR-A-containing AMPA receptors to hippocampal-dependent memory. Psychopharmacology 188:552–566. (1994) Spatial memory and N-methyl-d-aspartate receptor antagonists APV and MK-801: memory impairments depend n familiarity with the environment, drug dose, and training duration. Behav Neurosci 108:30–43. (2006) Post-training N-methyl-d-aspartate receptor blockade offers protection from retrograde interference but does not affect consolidation of weak or strong memory traces in the water maze. Neuroscience 137:19–28. (2005) Ketamine disrupts frontal and hippocampal contribution to encoding and retrieval of episodic memory: an fMRI study. Cereb Cortex 15:749–759. (2006) Dose-response characteristics of ketamine effect on locomotion, cognitive function and central neuronal activity. Brain Res Bull 69:338–345. (2002) effects of NMDA receptor antagonists: implications for the pathophysiology of schizophrenia. Arch Gen Psychiatry 59:663–664. (1997) Effects of triazolam and ethanol on proactive interference: evidence for an impairment in retrieval inhibition. Clin Exp Neuropsychol 19:698–712. (2005) NMDA-receptor blockade by CPP impairs post-training consolidation of a rapidly acquired spatial representation in rat hippocampus. Eur J Neurosci 22:1201–1213. (2005) N-Methyl-d-aspartate receptors as a target for improved antipsychotic agents: novel insights and clinical perspectives. Psychopharmacology 179:30–53. (2004) Targeting metabotropic glutamate receptors for treatment of the cognitive symptoms of schizophrenia. Psychopharmacology 174:39–44. (1997) Activation of glutamatergic neurotransmission by ketamine: a novel step in the pathway from NMDA receptor blockade to dopaminergic and cognitive disruptions associated with the prefrontal cortex. J Neurosci 17:2921–2927. (1998) Molecular determinants of NMDA receptor pharmacological diversity. Prog Brain Res 116:171–190. (2004) Acute effects of ketamine on memory systems and psychotic symptoms in healthy volunteers. Neuropsychopharmacology 29:208–218. (2001) NMDA receptor regulation of memory and behavior in humans. Hippocampus 11:529–542. (1979) Remembrance of places passed: spatial memory in rats. J Exp Psychol Anim Behav Process 2:97–116. (1997) Posttraining injections of MK-801 produce a time-dependent impairment of memory in two water maze tasks. Neurobiol Learn Mem 68:42–50. (2001) Calculation for the chi-square test: an interactive calculation tool for chi-square tests of goodness of fit and independence [computer software] Available at http://www.psych.ku.edu/preacher/chisq/chisq.htm. (2006) Behavioural pharmacology: 40+ years of progress, with a focus on glutamate receptors and cognition. Trends Pharmacol Sci 27:141–148. (1993) Regionally distinct N-methyl-d-aspartate receptors distinguished by quantitative autoradiography of [3H]MK-801 binding in rat brain. J Neurochem 60:1344–1353. (1999) Delay-dependent impairment of a matching-to-place task with chronic and intrahippocampal infusion of the NMDA-antagonist d-AP5. Hippocampus 9:118–136. (2000) Dysfunctional brain dopamine systems induced by psychotomimetic NMDA-receptor antagonists and the effects of antipsychotic drugs. Brain Res Brain Res Rev 31:320–329. (1996) NMDA receptor antagonists impair prefrontal cortex function as assessed via spatial delayed alternation performance in rats: modulation by dopamine. J Neurosci 16:373–379.